A moment caught me by surprise today, and as is often the case I wanted to write a bit to get my thoughts together. As my wife was driving the boys to daycare today, she told me that a few of the roads on my route to work were closed, and that I would need to find another way around. So I took the back way, winding my way through our community until I went past the high school. As I went past, I saw almost all of the student body outside, standing around. It took a second to connect the situation in front of me with the posts I had seen on Facebook. I was driving past an active shooter drill. I was driving past a school preparing it’s students, a healthy number of whom come to my own youth group, for the eventuality of someone bringing a weapon of mass destruction into their hall ways and opening fire. I caught the eyes of a few students, and there were of course the “let’s laugh this off” kids who were having a great time. But I don’t think I was imagining the look of fear in a couple of student’s faces. And then I imagined my own kids going through the same drill, and things took a turn. Look, I know that we as a culture are still somehow not ready to deal with the issue of gun violence. We lack the political will to actually make progress. And I can predict with alarming certainty the responses to a blog post like this. The left will say we should ban all weapons. The right will say it’s a constitutional right. All will try to fit me into one of those buckets or the other, just so they know how to deal with me. And we’ll move on. But there was something for me about seeing actual students actually preparing for an event that no one can promise them won’t happen that put things in a new perspective for me. I know we lack the political will to get stuff done, but I really want to help us start to move in that direction. 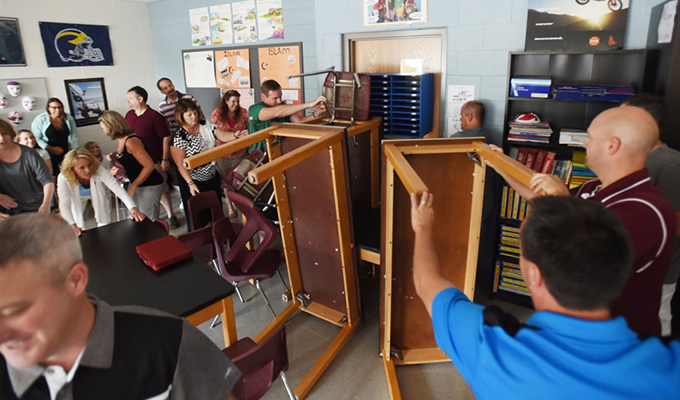 I know that every side has a problem with the proposals of the other side, but I have to tell you that I have a problem with the students in my community having to train for active shooter drills. That’s not the America I want to live in, and the best part of America is how much we get to shape it. So in this moment, in the (probably all too slim) silence between these mass shootings, when no one is actually talking about it, why don’t we talk about gun and violence issues in our country? Why don’t we brainstorm some better solutions? Why don’t we raise up leaders who are more willing than our current batch to get some stuff done? Our kids need us to act. Let’s get to it.